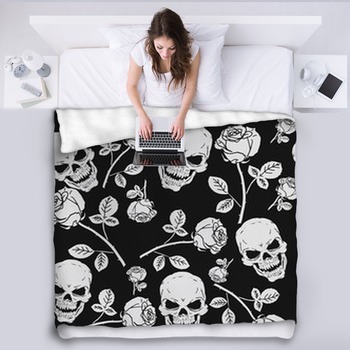 For decades, skulls have been an essential part of rock n roll, punk rock, heavy metal, and skateboarding culture, and they keep getting more and more popular. 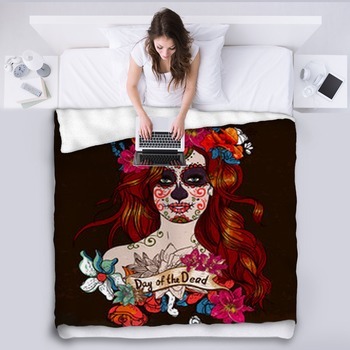 So give your son or daughter one of our skull blankets, and choose a theme that best represents their own style, whether it's graffiti, life-like paintings, comical cartoons, or fine sketches of skulls. 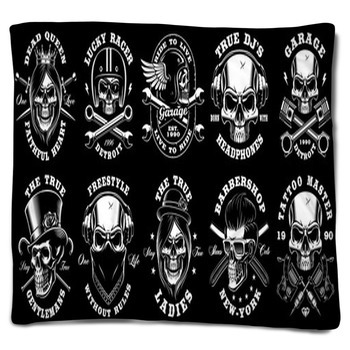 Your teenage son will be amazed that you thought to get him a woven blanket that features a classic punk tattoo style grinning green skull. This gnarly character has weary yellow eyes, a smoldering cigar in the corner of his mouth, and a black and green checkerboard striped brown derby hat on his head. 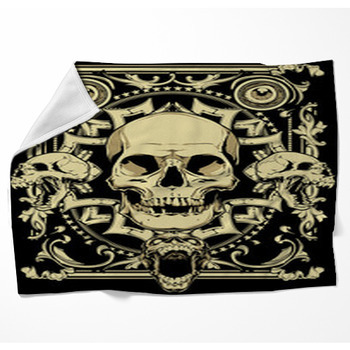 Another favorite skull blanket for boys displays an incredibly detailed charcoal pencil drawing of a grimacing voodoo skull. 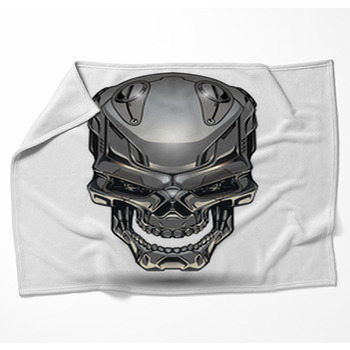 The heavy metal skull is grimacing at you as his tattered hair shakes with dirt from the tomb, and an ancient cross tattoo adorns his forehead. 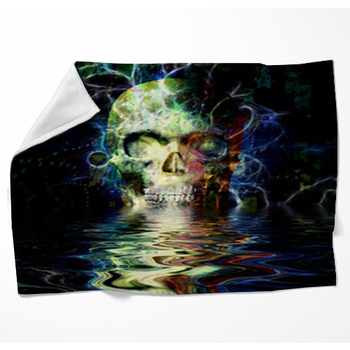 For girls, we have fleece blankets that picture cute depictions of skulls. 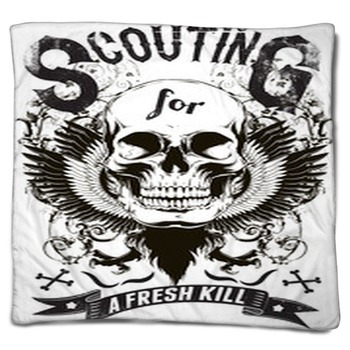 These include throw blankets that are decorated with a white skull and crossbones set on a solid black background. The adorable and funny thing about this skull is that she's wearing a hot pink ribbon on her head. 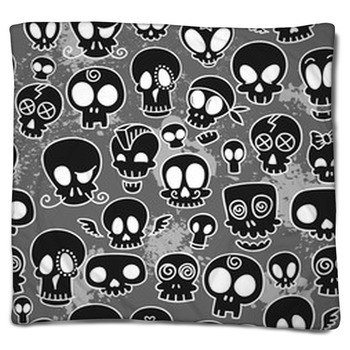 Kids get a kick out of our woven blankets that show a series of sixteen different skulls making silly faces. 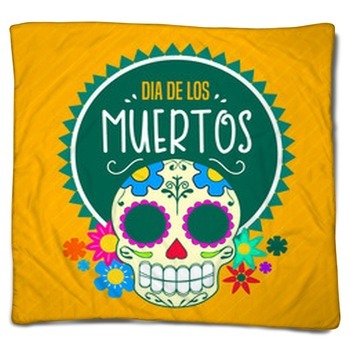 These skulls are colored with neon shades of pink, green, blue and orange, like a box of gummy candies. 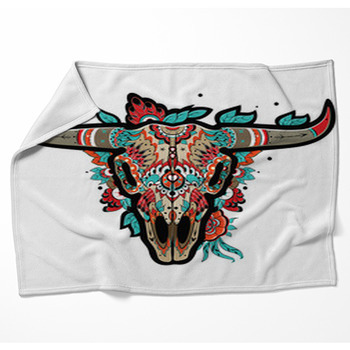 Some of our skull blankets even display complex, art gallery quality paintings. How about a bluish gray skull with long fangs and goat horns seen lying on cracked, dry brown ground in a desolate desert? 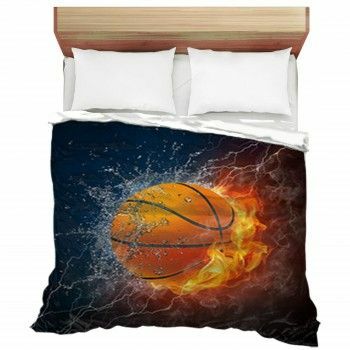 The background of these fleece blankets pictures a gorgeous orange sunset over deep gray mountains. 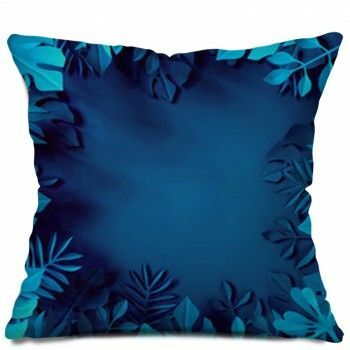 Continue to explore the motif of life and death by adding our skull themed wall murals and pillows to your order.